East Midlands Airport is easily accessible by public transport. A whole range of bus services make it quick and convenient to get to Nottingham, Leicester, Derby, Loughborough, Long Eaton and Coalville up to every 20 minutes, 24 hours a day, seven days a week. Travel on the high quality, frequent and direct Skylink service to Nottingham and Long Eaton, running up to every 20 minutes during the day and hourly at night, 24 hours a day, seven days a week. There is a new extension to Shepshed and Coalville, operating 7 days a week every hour between 5am to 11pm. For your fast connection from Nottingham you can now catch the new Express Skylink coach operating from Nottingham Broadmarsh every half hour, serving Nottingham Train Station, West Bridgeford County Hall, Clifton Nottingham Trent University, Clifton South Interchange and the airport from 5am until 11pm. For full up to date timetable, maps, live travel alerts and ticket information visit www.trentbarton.co.uk/services/skylinknottingham. For Skylink queries call 01509 815637. 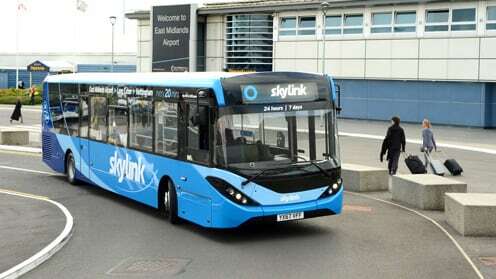 High quality, frequent and direct Skylink bus services to Derby, Leicester and Loughborough from East Midlands Airport run every 20 minutes during the day and hourly at night, 24 hours a day, seven days a week. For full up to date timetable, maps, live travel alerts and ticket information visit www.trentbarton.co.uk/services/skylinkderby. For Skylink queries call 01509 815637. The my15 bus runs hourly from the airport to Ilkeston, via Castle Donington, Old Sawley, Long Eaton (including the train station), Sandiacre, Stapleford, Trowell and Ilkeston. Travel on the high quality and direct Airlink service to Coalville, running every 60 minutes during the day, Monday to Saturday. This bus service is operated by Roberts Coaches - for queries call 01530 817444. Buses to East Midlands Airport arrive at and leave from the coach station, next to the terminal building.